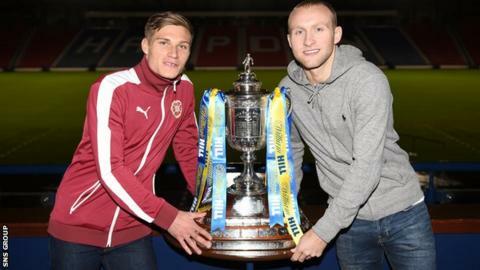 Hearts are to host Edinburgh rivals Hibernian in the fifth round of the Scottish Cup. Premiership leaders Celtic will travel to Lowland League side East Kilbride or East of Scotland Premier League outfit Lothian Thistle Hutchison Vale. Cup holders Inverness CT face a trip to Premiership rivals Motherwell if they beat Stirling Albion in a replay. Dundee United take on Partick Thistle and Kilmarnock visit Championship leaders Rangers. League Two Annan Athletic's reward for beating Hamilton Academical in the previous round is a home tie with Morton. The ties will be played on the weekend of 6-7 February. East Kilbride will meet Lothian Thistle Hutchison Vale on 20 January after Saturday's match was postponed due to snow and there will be enormous focus on the tie now that Celtic lie in wait. Hearts knocked out Aberdeen at the weekend in what was their first win in the tournament since they thrashed Hibs 5-1 in the 2012 final. The Edinburgh teams finished first and second in the Championship last season, with Hibs missing out on promotion in the play-offs. "We're the home team and we are confident we can go on and win," Hearts forward Gavin Reilly told BBC Scotland. "It's great for the fans and I'm really looking forward to the occasion." Hearts sit third in the Premiership, with Hibs similarly placed in the division below. However, midfielder Dylan McGeouch is not daunted by the task facing his side, saying: "We're a team full of confidence and we believe in our own ability. "Tynecastle is a tough place to go, the fans make a great atmosphere, but these are the kind of games you want to be involved in."